The beautiful parable of the water bugs and the dragonfly, written by an anonymous author, has often been a source of comfort and inspiration to those who have suffered the loss of a loved one. The dragonfly stands as a symbol of transformation and the different stages of life, a reminder that there is more to the world than our current perception allows. 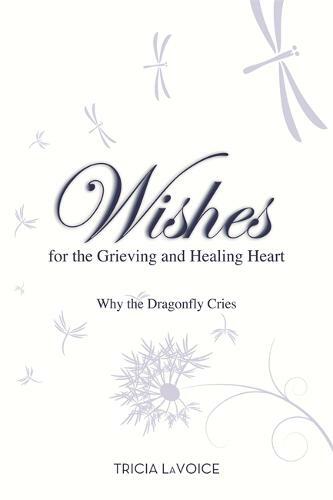 In Wishes for the Grieving and Healing Heart, author Tricia LaVoice expands upon this metaphor and uses her own personal experiences to deliver earnest insights into the emotion of loss. Her original prose, poetry, reflections and pragmatic suggestions address the pain and suffering we experience after losing a loved one. She opens an honest conversation on the courage and support it takes to properly grieve before finding the love we need from ourselves and others to begin to heal. This book is comforting and loving, candid and raw - and it's a must-read for anyone who has lost someone dear to their heart.